HSSB (Human Sized Solar Burns) 2016-2018 Each solar burn created over the course of one day. Installation shot of 14 in a series of 35. 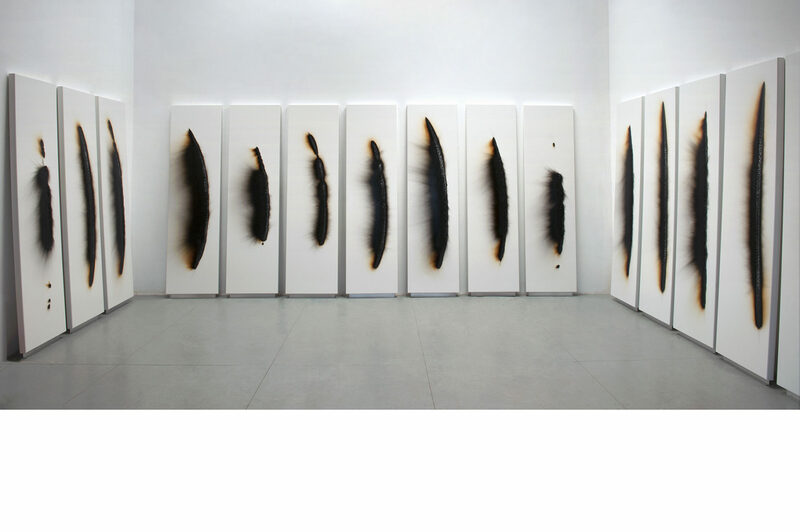 Each burn, 90 x 24.5 inches Solar burn on painted wood. HSSB (Human Sized Solar Burns) Cusp Set II Left to Right: Gemini/Cancer Cusp 6-21-16 Cancer/Leo Cusp 7-21-16 Leo/Virgo Cusp 8-22-16 Virgo/Libra Cusp 9-23-16 Libra/Scorpio Cusp 10-23-16 Scorpio/Sagittarius Cusp 11-22-16 Each solar burn, 90 x 24.5 inches Solar burn on painted wood.